The settlement of the Heights on Cleveland's east side was dependent upon electric streetcars with sufficient power to ascend the Portage Escarpment at Cedar Glen in the 1890s. From there, streetcars opened heights land for development progressively farther east until the Van Sweringen brothers faced the task of making their distant Shaker Heights project accessible to downtown. 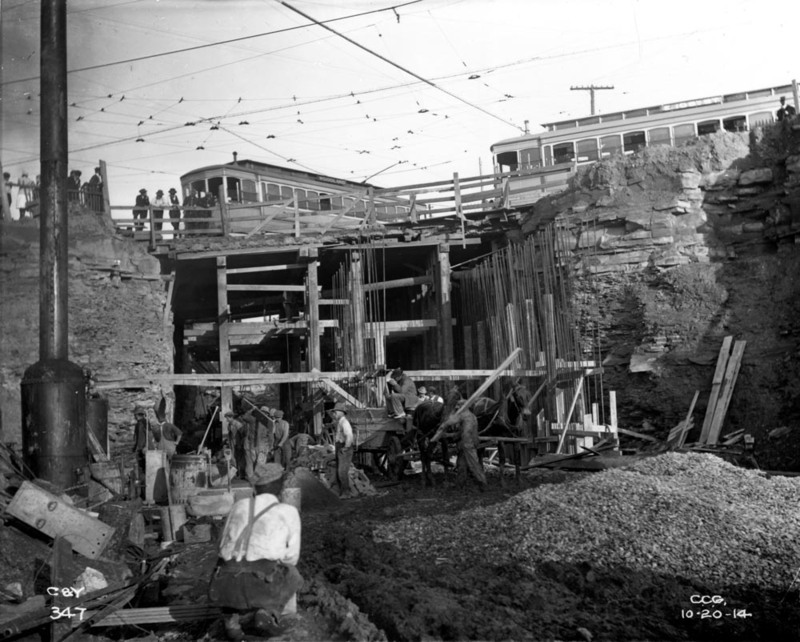 The Vans created the Cleveland & Youngstown Railroad to make this connection, envisioning an interurban train linking Cleveland to the growing east side, and specifically their Shaker Village development (later Shaker Heights). 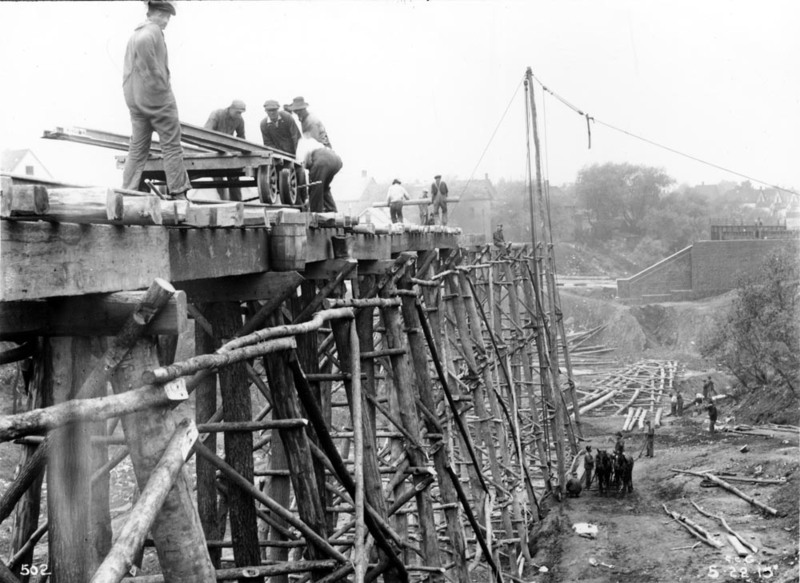 The C&Y became their means of performing a number of transportation projects, building freight yards for other railroads and, here, putting in place the infrastructure necessary to bring the Shaker Rapid down off the Heights. 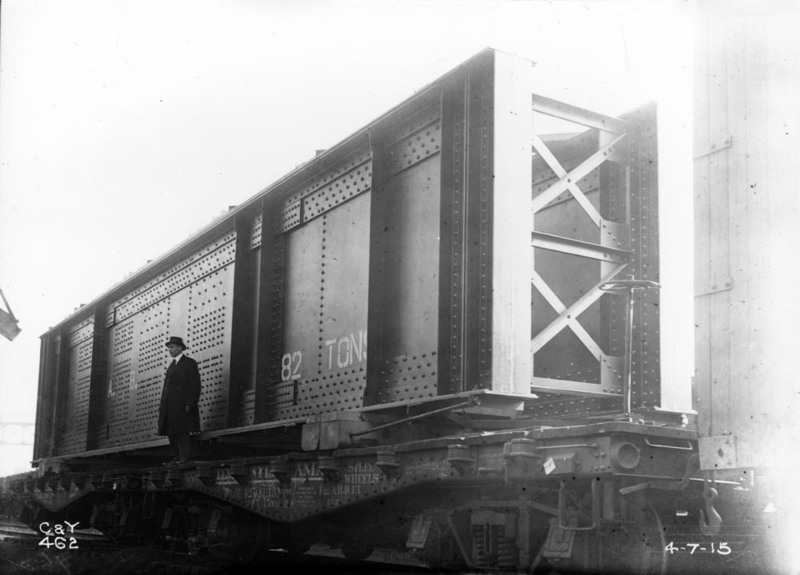 Trains, including the Rapid, require gentle grades in order to be operated economically. Too steep a slope and additional engines have to be added, or less weight can be hauled up hill, or both. 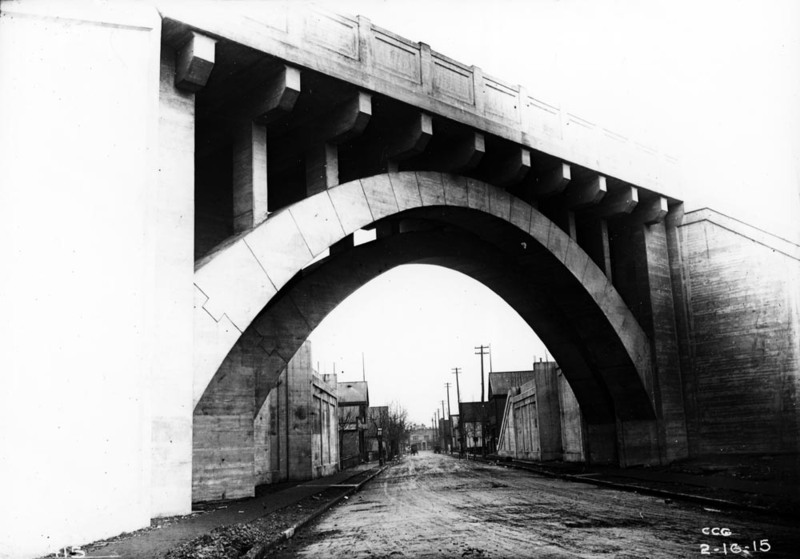 To traverse the eighty feet of elevation between Shaker Square and the base of the Escarpment cliff west of Woodhill Road, a long elevated roadbed was required, including several bridges to allow north-south traffic to cross below the tracks. This roadbed is a little over a mile in length, meaning the resulting 1.25 percent grade could permit the Rapid to run affordably between Shaker Heights and downtown Cleveland. The grading of the Rapid's right-of-way actually starts at Shaker Square, as the roadbed gradually descends into a trench between the two lanes of Shaker Boulevard, eventually becoming deep enough to pass underneath Woodhill Road. From that point west the tracks emerge onto an elevated bed that gradually descends to the level of the city. 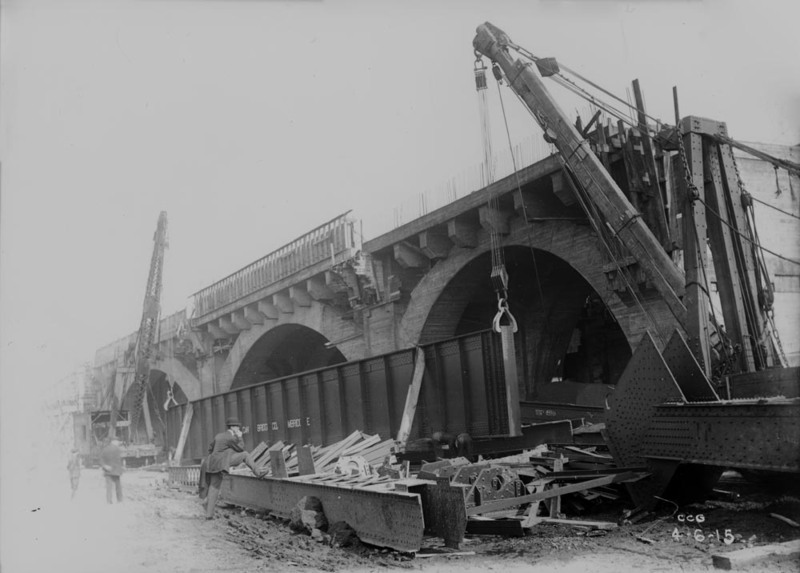 In doing so, it crosses over nine streets and two sets of railroad tracks, each of which has a bridge carrying the Rapid overhead. 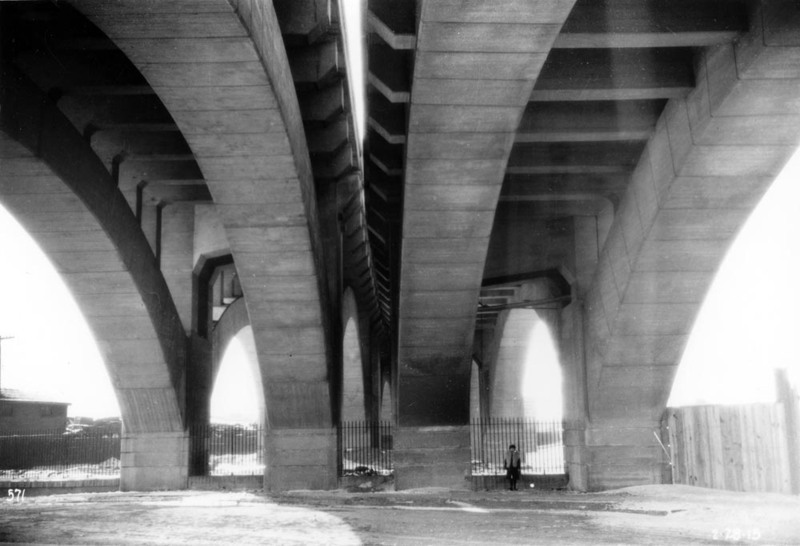 The bridge at Holton Avenue is one of Cleveland's most interesting and unappreciated structures. 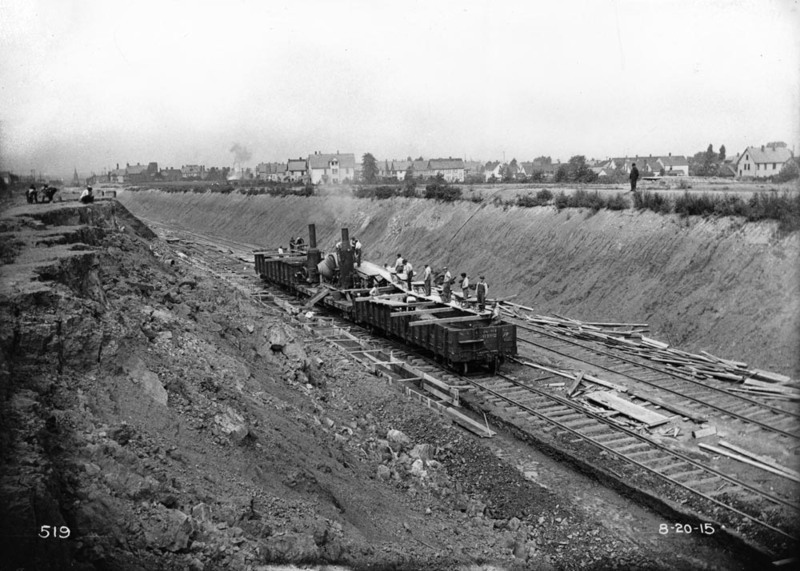 This roadbed was created by building a temporary trestle of logs to get the tracks sufficiently elevated. 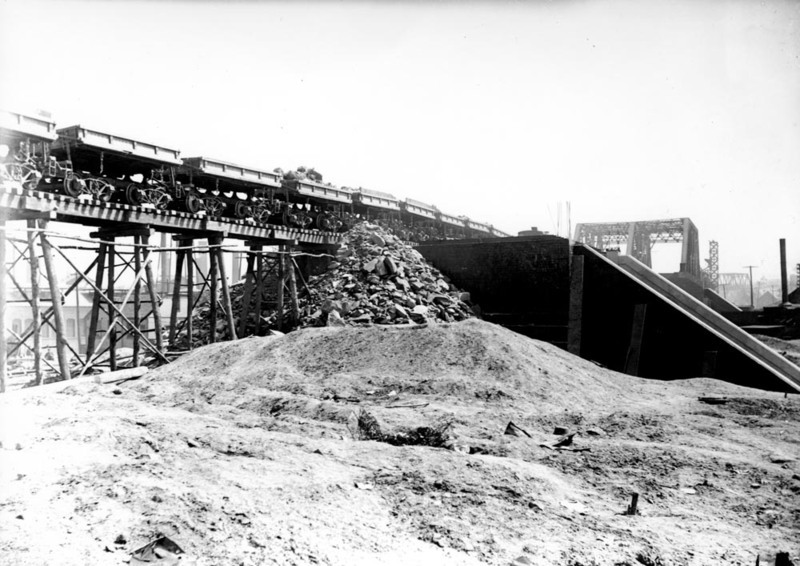 Then trains of hopper cars were brought in on these tracks to dump large quantities of dirt and stone ballast to fill in the trestle. This was more economical than trying to pile up the ballast from below and then place tracks on top later. At first the Rapid reached the bottom of the roadbed and moved onto tracks in the city's streets to finish the journey to Public Square, but that was only a temporary expediency. The ultimate goal was to bring the Rapid into the lower level of the Van Sweringens' new Cleveland Union Terminal passenger station beneath their Terminal Tower complex. 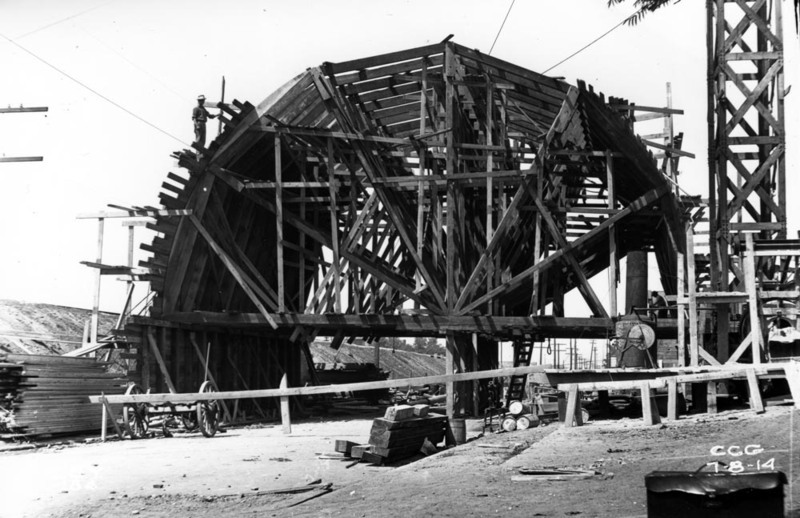 To do this, the trains needed to come into town near the level of the river, where the major railroad passenger trains would also be delivering passengers to the C.U.T. This entailed extending the Rapid's grade dozens of feet lower, which they did through the gradual descent of Kingsbury Run, a tributary of the Cuyahoga River. It was the need to secure rights to use existing tracks of the Nickel Plate Road that led to the Vans purchasing the Nickel Plate Railroad and becoming a major player in North American railroading in the 1930s. 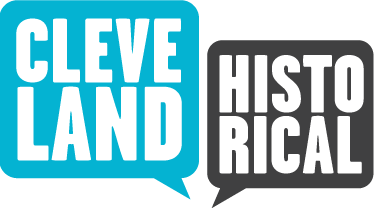 But the original focus of their attention was developing Shaker Heights up on the Portage Escarpment and making it possible to move their homeowners quickly to their jobs in downtown Cleveland. This led to their building the Cleveland & Youngstown's elevated roadbed that is largely unseen by the multitude of people who still ride the RTA's Green and Blue Lines west of Shaker Square, but deserves to be recognized as an important piece of Cleveland's urban infrastructure. William C. Barrow, “Cleveland and Youngstown Railroad,” Cleveland Historical, accessed April 23, 2019, https://clevelandhistorical.org/items/show/658. Published on May 16, 2014. Last updated on Apr 18, 2017.